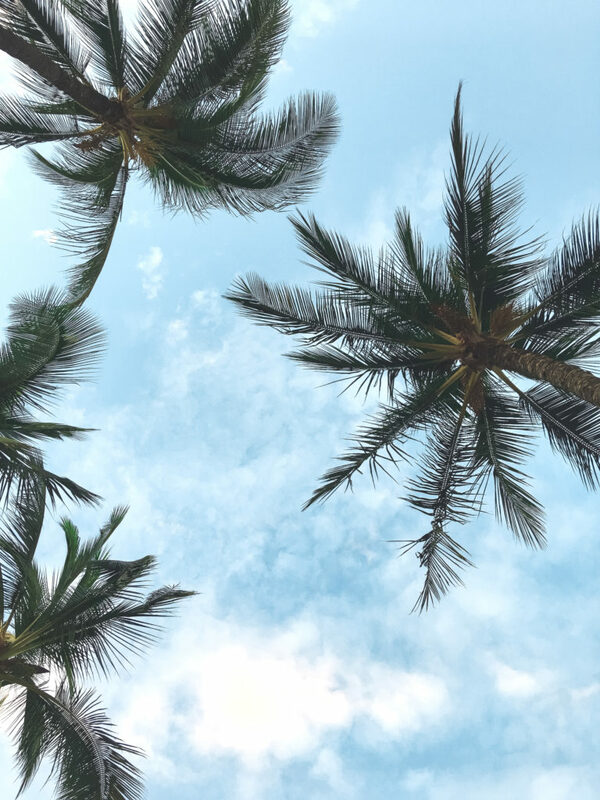 We are SO EXCITED to be heading to the Florida Keys for Spring Break next week! We planned this trip a year ago and we’ve been counting down the days all winter. Ever since we knew we’d be having a baby, I’ve been telling Thomas every time we took a trip and things felt a little chaotic: “Just wait until we’re flying as a family of four!” And here we are. Honestly I’m quite anxious about all the logistics, and I’m trying to get as organized as possible. I’ve been packing little by little and making lists all week. We’re flying out of Richmond so that we could get a nonstop flight, so that does make things so much easier than running through an airport to make a connection (I’m looking at you CHARLOTTE Terminal E! Also, Please CHO airport, we need just one nonstop flight to somewhere warm in the winter!) Our flight leaves first thing in the morning, which means getting up at 3am and making the 1.5 hour drive to Richmond. Mazen will be fine. I’m crossing my fingers Birch doesn’t cry the whole time. I bought a new car seat bag (my old one was MIA!) to hold Birch’s Mesa and crossed my fingers the Lotus crib we bought would fit in there too. IT DID! 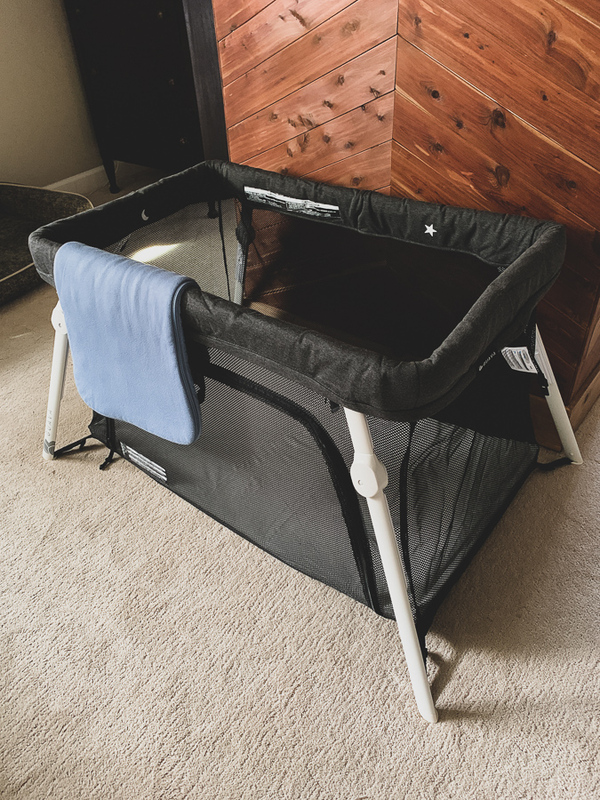 The reason we are bringing the Lotus crib is that the resort does not offer cribs and renting a pack and play would cost over $100. It was cheaper just to bring our own. If it did not fit, our back up plan was to wear the crib on our back through security. Or just pay to check it. I love the new car seat bag, and it’s a lot better than the one I loaned out and lost, so it was a good purchase. The back pack feature will be nice when we have to carry this from baggage claim to the rental car. Or maybe we can get a push cart… it’s really heavy! (free) Mazen’s booster loose because it’s a cheapie Graco and I don’t care if it gets scuffed. And it won’t fit in the car seat bag! 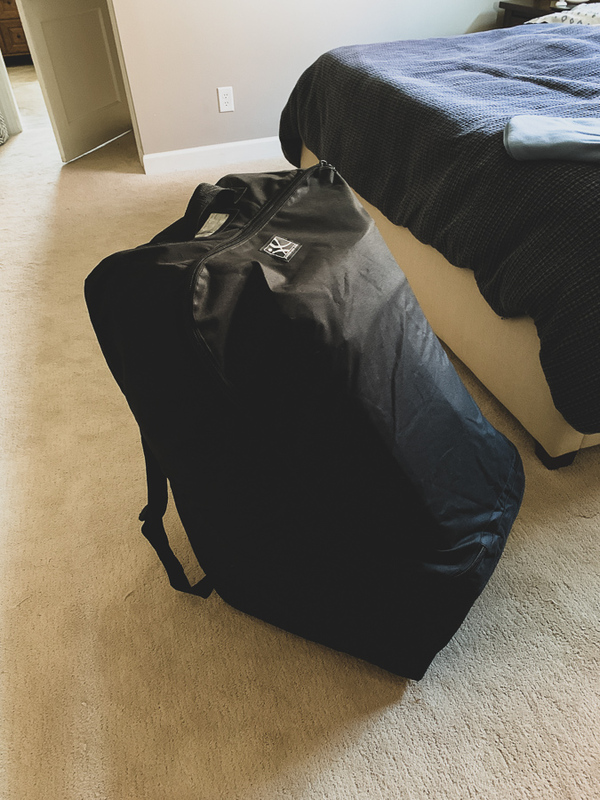 ($25) one giant suitcase to hold clothes for Thomas, me and Birch. Bringing laundry detergent because our accommodations have a washer/dryer (a dealbreaker on why I chose this resort – I can’t wait to tell you all about it!) I really hope our one giant suitcase is not over the weight limit. We’re going to buy things like diapers, wipes, and sunscreen when we arrive. At least we just need warm weather clothing! Me: Birch in the Boba carrier on the front and backpack with diaper bag items on the back. Mazen: Walking with his rolling suitcase. Possibly wearing a backpack too. Thomas: Backpack with all of our carry-on valuables and things we need in flight. I’ll have Thomas wear Birch on the way home! I considered bringing the stroller through to the gate along with its travel bag and attempt to gate check it so we can put some things underneath and not have to wear/carry everything. American Airlines has a 20 pound stroller limit, and the Cruz + bag is too heavy, BUT lots of people online said they were able to gate check it just fine. If we can get it through security then worst case they would just put it to baggage claim, which is totally fine. The main reason I decided to check it is so we can have it perfectly packed before we leave our house and not have to worry about taking it apart and stuffing it into the bag last minute at the gate (at 6am…) Plus it’s free to check so there is no con to checking it. We could bring an umbrella stroller instead, but I don’t think Birch is quite sitting up well enough for one, and we’d really like to have the Cruz during our trip in Florida. And now that I’m formally mentioning the Lotus crib, we love it!! Birch has been sleeping in it in our room and he’s been sleeping well! 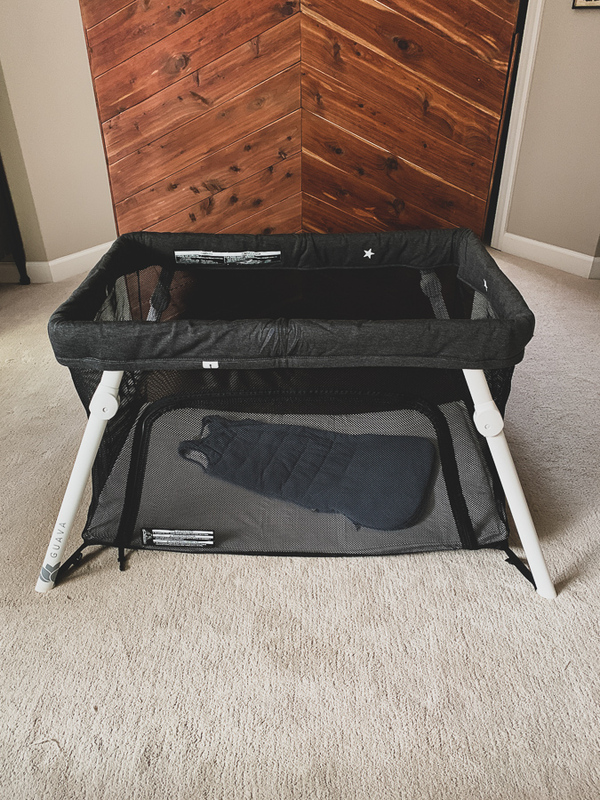 It’s so much softer and cozier than our Graco pack and play. It’s REALLY easy and fast to set up. And it’s so much more lightweight than the Graco, which we would not have attempted to fly with. I also love that the Lotus can be worn as a backpack in case we need to do that at the airport, or simply carrying it from car to hotel. I decided the cost was worth it because we’ll be doing a good amount of traveling in the next year, and this is something he will be using well into his toddler years. It came highly recommended by my sister, and after trying it at her house I was sold. I bought both the matching cotton sheet and the plush quilted sheet for when he’s older. Birch got too big for his bassinest but he’s still waking up too much to sleep downstairs to his nursery all night, so this is our crib solution for the short term. I have so much to share on the sleep front, but I’m kind of waiting for us to solve our issues so I can share how it all went down. The short story is that the perfect storm of sleep regression hit us at 4 months and we’re still figuring out how to sleep again. We also LOVE the Kyte sleep sack that my sister gifted us! It’s our favorite one. So soft and easy to zip. Part of the reason he outgrew his bassinet is because he is on the move! Rolling both ways, doing 180 degree turns. Look at him move across the blanket from one side to the other! Please share your travel tips!! What am I forgetting? I love the Lotus so much! We actually wound up using it as my son’s main bed for like a year and a half. He slept so well in there and I loved that I could unzip it and lay down with him when he was little and needed comforting. I’m already anxious about the logistics for our first trip with two this summer. Have a great vacation! I would totally recommend bringing a stroller all the way to the gate. Granted, I am usually flying alone with my kids, but even when my husband is with us it is nice to be able to just sit down and take inventory after making it through security to the gate. The other thing to consider is a delay – and then you’d have to be wearing B or passing him back and forth. Just a thought. I have lots of friends who never bring the stroller to the gate! If he’s not sitting upright well in an umbrella stroller (which sounds like your best option to bring to the gate), consider rolling some lightweight muslin blankets and putting them at his sides. I’m sure either way – stroller or no stroller – once you get to the gate and can breathe, you’ll feel like you’ve finished a huge part of the race that is traveling with more than one kid! The only other suggestion I have is to drive to the airport the night before and stay at a hotel. Oftentimes they’ll have a shuttle and you can sometimes even park for free during the entire trip. On the way home, you can send your husband and M on the shuttle to pick up the car, and they can swing back to the airport to get you and any luggage they didn’t take, or you can all just shuttle back to the hotel to get the car. Choose a hotel with breakfast, and if you have to leave too early they will sometimes pack a bag of fruit or something for you to grab and go. Thanks for the suggestions! We considered the hotel option and think just getting up is going to be equally as logistically hard. Since we’d still have to get up at 4:30/5 at a hotel. I also love bringing a stroller to the gate. I know so many people swear by checking it and baby wearing but both of my boys like to have space and “be free” from me, too, so it always works well for me to have a stroller, even if it is a pain to get through security. Can’t wait to follow your trip!! I absolutely love the Keys and just hearing you mention your trip makes me want to scuba dive again ASAP!!! I agree that taking the stroller all the way to the gate is helpful. I have a 7 month old and 3.5 year old though, so the older kid usually can’t walk all the way to the gate (in the time frame we’re working with!). Also, the stroller is just a catch all and I basically use it as a cart to hold coats, back packs etc. I will wear the baby most of the time. Your lotus is really nice so you probably wouldn’t want to downgrade to a regular old pack and play. 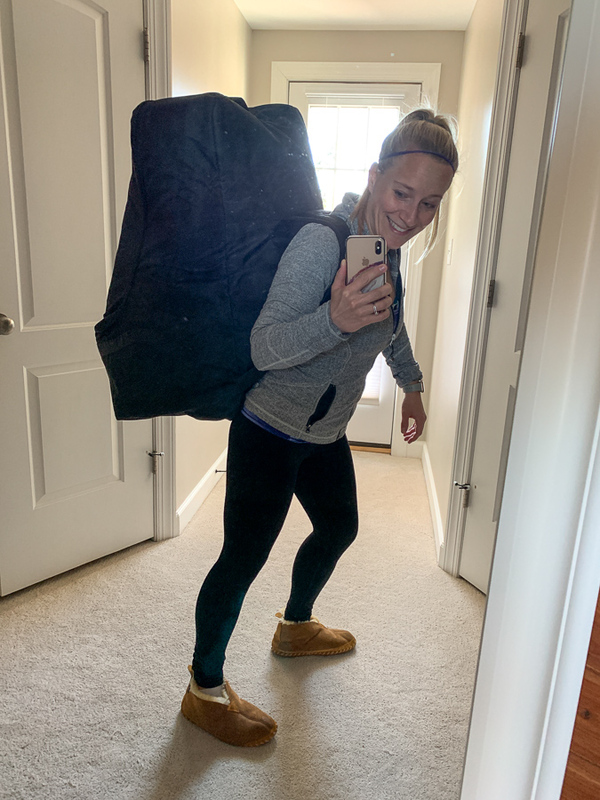 But, if you’re ever flying alone with the kids and simply can’t carry all of that yourself, you could consider shipping yourself a pack and play from Amazon to your destination. You can get the basic one for like $35 and leave it behind. We’ve done this a couple of times. You are so brave to fly alone!! Dang that’s huge! We always used a Cosco seat for travel for babies/toddlers – so much more light weight and don’t need to worry about damage. But our kiddos used on the plane so we didn’t need to check it. For our last trip I had my oldest (Mazen’s age) use a bubble bum and I highly recommend it! It’s one less thing to worry about and it’s small, and packable. Traveling with kiddos is such a logistical nightmare – but it sounds like you have a great plan. The Keys will be a great place for the family – enjoy your vacation! I plan to get a cheap car seat when he’s out of the infant one because our “big boy seat” – the Clek Foonf is a BEAST. And I’m looking up what a bubble bum is! The Foonf is a BEAST! Have you heard about the new travel safety seat, Wayb? You have some time until he’s old enough (age 2) but it looks pretty awesome! There is also the IMMI GO which is also used by ride share companies. I like that the bag is attached. It looks like you have everything packing wise covered! Leaving at 3 a.m. to start a fantastic trip sounds exhausting so maybe look into staying near the airport the night before to have an easier start to your fun time away? Just an idea. We thought about this, but unpacking and re-packing seems like it would be even more challenging than getting up early! I wish I had known about the bassinet. Might have gotten it over the Halo. Although I loved how high the Halo was next to my bed. 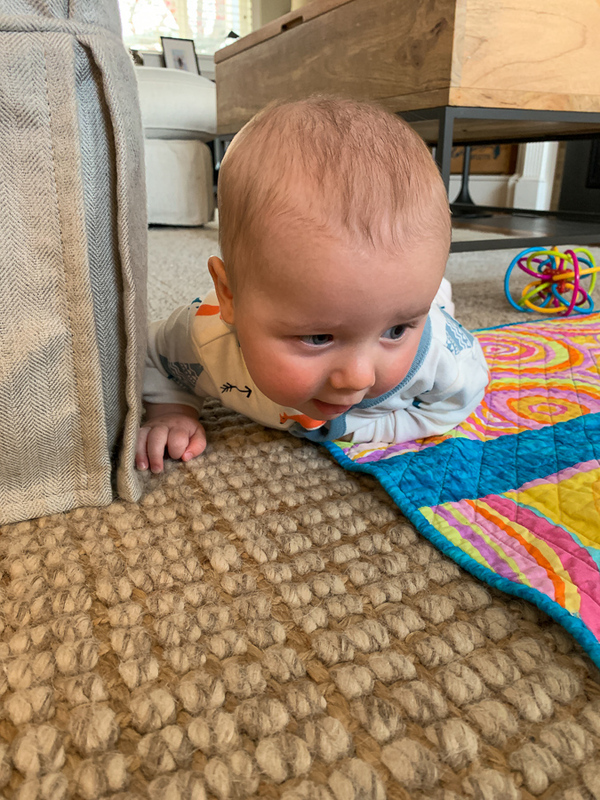 We had some regression with our now 7 month old as well, it’s terrible when you get back used to sleeping and then start waking up multiple times! One thing that helped us was we noticed that when she started rolling and getting more mobile she slept worse in her sleep sack. I think it limited her mobility and it frustrated her. We started just having her sleep in footie pajamas and it helped her alot! I haven’t traveled with my little one yet, but several moms have mentioned packing things IN the car seat bag. I think you could put diapers and other baby essentials in there as well. Just an idea so you don’t have to buy as much when you get there. This was my plan until I realized the crib fit! 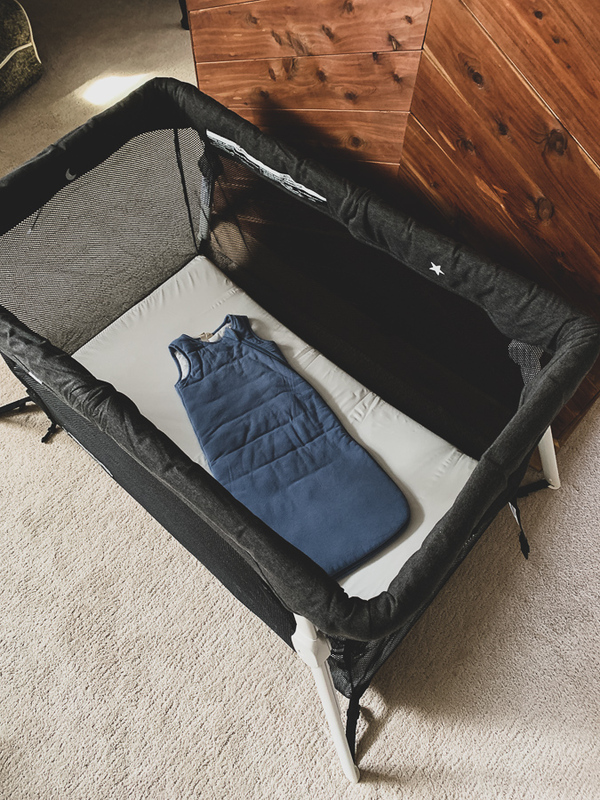 Car seat + crib leaves zero room for anything else, but if we ever don’t have to travel with the crib, I would totally stuff the bag full of diapers! We have the lotus and you can stuff a lot of diapers in it’s bag! Like a whole weeks worth! Then where would you put the crib!? Haha, I meant after you put the crib in you can stuff a lot of diapers in it’s folds. We took it to Europe and I put the kids sleep stuff (pjs, soothers, waterbottle, stuffy) and a bunch of diapers in the cracks of the crib after putting it in the bag. Oh gotcha!! I left the sheets on and it was super tight, but I bet I could squeeze more in there! I usually tried to squeeze more into the car seat bag as well but twice I was asked to open up my bag by the agent and was told that only the carseat was allowed and free and we had to pay since we had so much other stuff in there. This was on American both times. It was ridiculous! Yikes!! If that happens we’ll have to just pay for the crib I guess. I meant to add that they are also available on Amazon, so maybe you can get super quick shipping for this trip! AMAZING! Priming one here today!! You are super organized so I’m sure you’ll do great. We used to travel with three kids under 3 1/2 and were no where near as organized. My only suggestion is to NOT take advantage of the early boarding. I would get on at the end to avoid time having to be still on the plane. Have fun! That is a good tip!! Yes to this! Before getting on a 15 hour flight with a one year I was all about letting her crawl around like a crazy baby until boarding at the last possible second. The only time this isn’t the best is if you are flying Southwest, but otherwise I highly recommend limiting the time on the plane by boarding at the very end. I think the biggest tip we have for traveling with kids is TSA PreCheck. It’s such a lifesaver going through security without having to remove shoes, laptops, jackets, etc. Even with it, we still need a bit more time because we typically have her stroller and giant Nuna Sena carseat, but it definitely is worth the extra cost. The Lotus is hands down our favorite baby product. Not only for all the things you mentioned, but because she got really sick in one night and the entire thing is machine washable! When I couldn’t get the blueberry stains out of the mattress, they sent me a free one and rushed it. 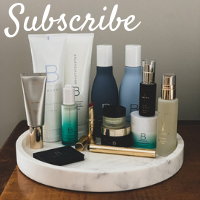 Amazing company and amazing product. It’s also great that I can lay down with her if she’s having trouble falling asleep. We joke that she sleeps better on vacation than at home because of it. We have PreCheck and it is amazing! So glad to hear good Lotus reviews 🙂 And welcome to the Cville area!! You are SO organized! Very impressive. Much more than I was when we moved to Europe with a 2 yr old and a 4 month old! Are you holding B in your lap? Do they even still let you do that? I hope you’re still breastfeeding. Saved my life flying overseas! Yes and yes! I have still have YET to see a car seat on an airplane! We always use a carseat, and I’ve seen lots of other people with carseats on planes. I don’t think it’s THAT rare. We have a Cosco Scenera Next – super light and easy to get through the airport. We bought a backpack for it, but it ended up being more trouble than it was worth, since it’s easy enough to just loop the strap over your arm and carry it that way. That’s so funny bc I always fly with a car seat when my kids are 18 months-3 and the last flight I was on had multiple kids in car seats.I don’t think it’s necessary when they are under 1 but it has saved us during that super squirmy want to move age (before they understand that they need to sit quietly and draw or watch a movie. Plus once they are 2 , you have to buy a seat for them anyways. We also bought a cheap “safety first” brand car seat just for travel. Much lighter than our Chicco next fit. Was wondering—do you have Mazen in a 5 point harness/booster combo or just a booster? Our older daughter is almost 6, and we are starting to think about that. It’s inexpensive and reclines so a baby who can’t sit up can use it. It’s inexpensive so it does not matter to me if it gets banged up when checked. It has a storage basket and fairly large sun visor. My sister has several high end strollers and got this one for travel also. It’s a great value. Thanks! I already own an umbrella one, so in the future I will probably use that. But good to know about this one! We have the lotus and love it. Mentioned in one of your previous posts, we used it as a bassinet and since I went back to work (about 20 months now) she’s used it M-F at our babysitter’s for naps. We’ve also traveled with it several times. We check it separately (I have airline status so haven’t had to pay for it). I know it’s tight in the bag, but i found once everything is in the bag, before you bend down the legs I could fit in a monitor and/or sound machine, if those apply to you. Or maybe the sleep sack, just to keep all sleeping stuff together for easy access. I think traveling with stroller is total personal preference. When our daughter was young I used a carrier and we didn’t bring a stroller (borrowed from family). Once she could sit up in a stroller we brought an umbrella stroller, usually gate checking. In our most recent trip we didn’t bring a stroller (family had one at our destination) to give her a little time to walk between flights and when she was tired or slow we had her sit on our small upright roller suitcase and she held on as we rolled through the airport. I’m sure that’s not for everyone but worked well for us! I have the Lotus too and love it so much! My 10 month old is actually using it as his bed because my older son is still in his crib and they both are sleeping through the night. I’m not ready to mess with it! Anyways, I’ve flown with one 8-month-old alone, with my husband; and a 3-year-old and a two-month-old a few times with help. You will have to take Birch out of the carrier during security, because Mazen is older this perhaps won’t be a huge issue, but I found that incredibly challenging even with my mom’s help. I had to fully take the carrier off and also get the stroller through the x-ray machine. Since I had to take him out both times and then repack everything/organize, I liked being able to place the baby in the stroller. I gate checked the stroller and wore him onto the plane then. I agree that you don’t want to board early. More time confined to a small area. Nurse on take off and landings. I pack diapers, wipes etc. into the car seat bag. I’m not sure if there’s any space for that with the Lotus. Warning: they sometimes can be sticklers that there can only be a carseat in there, so be prepared. I have had them make me open the bag. Enjoy your trip! Do you have TSA pre? I have never had to take my infant out of the carrier to go through security/x-ray machine. Have fun! We just got back from the Keys and had a great time! I think most (if not all) rental car companies provide booster seats if that helps! We stayed at the Ocean Reef Club on Key Largo. It was amazing! Lots of great resort options in the Keys! We went to Hawaii with our six month old and 2.5year old and checked two car seats, brought a tiny umbrella stroller through the airport that either could sit in, and the ergo for the babe. We rented 2 pack n plays along with a high chair and infant bath tub and toys for about $100 for the week and it was the best decision. Maybe check into other baby equipment rental options?? That’s stupid expensive! Have fun! I looked into this and renting a basic pack n play was $100 so I bought the Lotus instead. Since it’s so travel friendly. I almost just bought a Graco for $50, shipped it there and donated it at the end but that felt a bit wasteful. What are you referring to in your comment about Charlotte Terminal E? I’ve had a couple layovers in Charlotte and it seems like such a nice small quiet & easy airport. It reminds me of Kansas City’s airport. Just wondering for future reference! We always fly in and out of Terminal E because it’s where all the small planes are and Cville is always a tiny plane. But if we have a connection – which we always do – it’s usually to a bigger city – which is always out of a terminals A,B,C a half mile away (because E is soooo long!) and the whole connection time is usually like 45 minutes. It takes the whole time to run to the other side of the airport. When we flew home from San Diego I was 30 weeks pregnant, running, holding Mazen’s hand in one and his suitcase in the other and we barely made our connection! Remember Kids stuff (strollers, cribs, carseats) always check free! My 11 month old has flown cross country 4 times so far at 2 months, 4 months, 8 months and 10 months. He has always had his own seat on the plane so we gate checked our stroller which was holding the infant bucket (and him of course) through the airport. Once he switched to convertible I check the stroller and attached his car seat to a roller bag. Make sure your diaper bag is packed for two full days of diapering supplies and double the outfits you think you’d need. I also had a change of clothes for ME in case of a particularly bad blowout or spit up. There is nowhere in the airport to get diapers or wipes and if you end up delayed or diverted you could easily use up all your supplies. Don’t bring too much other stuff, he required zero entertainment on the plane at 4 months old. Also no matter what happens on the flight it’s only a couple of hours of your whole trip so don’t stress too much! Good tip on possible delays and extra diapers! I forgot! I also put a cloth diaper cover over a disposable when we fly. It really almost completely eliminates the possibility of a blowout and ruining his car seat before we get to our destination. Can I ask what kyte baby you got? We purchased the 6-12 mo (we are 6 months) and it’s like a mermaid tail! But the 0-6 fits just right, but we will be out of it soon! I’m interested to hear what you have! I fly alone with my 2 1/2 a lot (lucky kid!) and have gate checked a Thule jogging stroller which is massive. American Airlines didn’t say anything but it was a total pain. I nowhere use a less expensive stroller only for flying. It’s wlways nice to have a safe place to contain my son especially if we have an unexpected delay and are stuck waiting. We flew out of RVA in December and parked in the cheaper satellite parking. If you are feeling stressed and pressed for time – do not do this! Pay the extra and park in the closer lot. The shuttle seemed to take forever and stressed me out! At least you are flying out of a smaller airport so security and getting to the gate is pretty easy. Thank you! We’re planning to have Thomas drop us and all the gear off at check in and go pack. I’ll be sure to tell him to park close by! I didn’t read all the comments, but you all should just go stay in a hotel near the airport the night before! A Kilofly travel tent is way cheaper and more convenient to travel with. I’ve flown with my baby solo a few times and only needed to bring a backpack because of it (no checked bags). Also, get a cheap cosco seat and bungee it to a handcart – serves as a stroller, and you can use the car seat on the plane if there is an extra seat. I flew alone with my two boys (3 and 6) and I badger much debate I brought my double umbrella stroller and gate checked it and so glad I did. While my 6 year old didn’t need it, it allowed me to keep them contained , move fast and served as a catch all for my things. We also got home really late so they were both sleeping and I was able to put them in it and keep moving. I don’t know how I would have managed without it even though my kids are getting old for strollers it worked!!! We have a 3.5 year old and a 12 month old. My biggest travel tip is to travel LIGHT! I would definitely leave the stroller at home. And if you have AAA, you can rent car seats for free with Hertz. That’s great to know about Hertz! what is Birch’s sleep like these days? my little one just hit the 4 mo regression too! would love any advice you have. did Mazen go through the 4 mo reg too? I highly recommend following Little Z Sleep on Instagram. Her stories and tips are great. 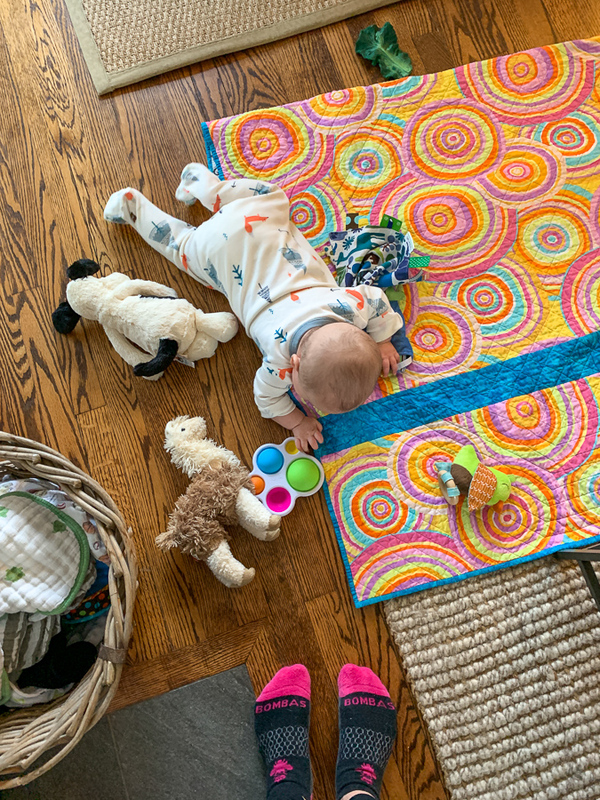 We hit the four month regression too – related to learning to roll over and my mistake of nursing him to sleep during that time which just created an association that I had to un-do. But Becca’s tips brought us back out and he’s doing 10/11 hours again! 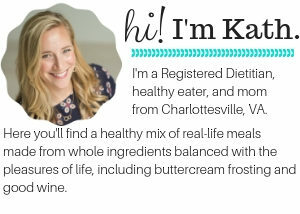 The main tip I learned was that when you nurse at night you should turn on all the lights, change diaper and wake them up – it’s eating time – and keep them awake at the breast until they are full. Because I was nursing him back to sleep he was wanting to nurse every time he woke up. But I was the one who taught him that so I just had to unteach him. Lights on and keeping him alert seems counterintuitive to get a baby to sleep, but it worked in just 2 nights! We are light packers & skip bringing travel crib and stroller all together especially with baby wearing. We just cosleep on trips & it saves the hassle. One bag for 4 people, buy diapers in arrival city, carry on snacks for the day & new little busy books & toys for the plane ride. Wikisticks are a super fun plane toy.